Landscape photography is amazing, and nature provides us plenty of opportunities to photograph various wonders throughout the United States, and our workshops make the most of a lot of those places. What if we could combine the wonder of landscape photography with the lore of rich history, and other unique cultural experiences? Well, we're always looking for new ways to provide our guests with not only amazing photographic options, and photography education, but also an amazing experience. We're sure you're going to LOVE our latest offering. The south has an allure all its own, and culturally there's not many places better to visit than Charleston South Carolina. Charleston is a seaside city with enough charm and history to fuel an entire workshop. 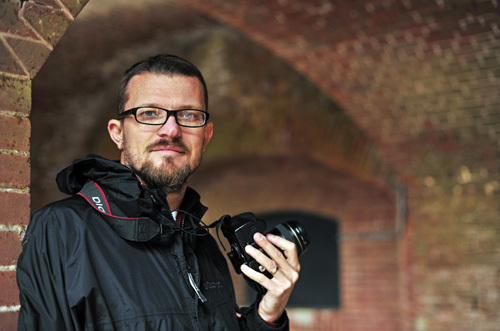 Join us as we explore the rich history and photographic opportunities in the city of Charleston and its surroundings. 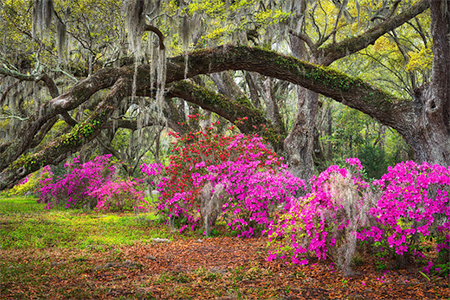 We'll explore historical plantations and photograph the beautiful foliage and gardens that surround them. 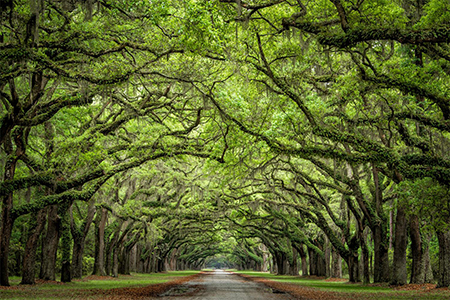 The iconic oak tree lined driveways, are amazing. These ancient trees have no doubt stood their ground for periods of an incredibly diverse history. The textures in the bark, and moss that has grown over them for decades gives the image we create here a special feeling, and when photographed in the right light...one can find beauty in areas that have been through less than beautiful periods of American history. We'll spend time in the famous Outer Banks, looking at the various piers and bridges that help give this stretch of coastline its distinct personality. 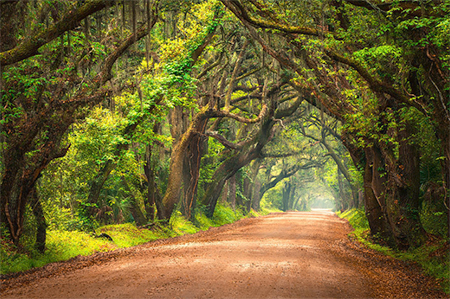 This stretch of the coastline boasts some of the best in photography options with places like the iconic Folly Beach Pier, and in contrast the barren and remote feeling of the coastal skeleton trees of Botany Bay. There's so much diversity to see in this region. 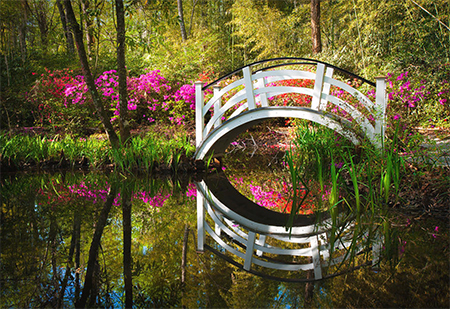 We'll also explore the wondrously beautiful Magnolia Gardens, where our cameras will look at grand architectural design, as well as the minute details found in the tiniest of plants. In addition, we'll explore many of the other historical properties in this area, the preserved, and the abandoned. 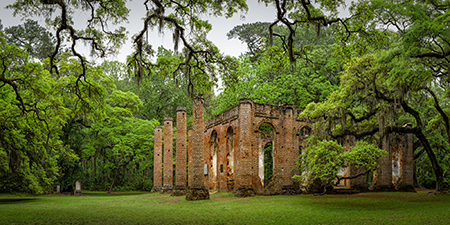 The old Sheldon Church ruins are some of the most fascinating in the south, and our cameras will be on scene to capture images that tell the story of a time and place. While summer in the south can be hot and muggy, we'll make our trip during the spring when the weather is more mild, and we're able to enjoy our time exploring. During our down time we'll get to feast on one of the south's richest traditions…..FOOD. Charleston has no shortage of amazing food options, and we'll make sure our group meals are partaking in some of its best and most delicious options. What are you going to do with all these images you're going to create? Stephen and Brian will take time on one of the days to help the group make the most of processing those images so that they look their best and are just waiting for you to return home to be printed! Won't y'all come explore the wonders of the south with us as we open up a whole new photographic adventure! Day 1: Our first morning will be spent exploring the Outer Banks. 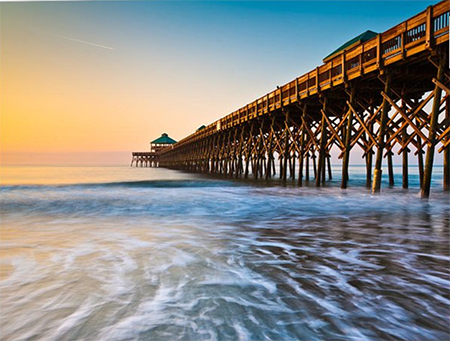 We'll start our morning photographing the beautiful Folly Beach Pier. We'll get your cameras dialed in for long exposures, and help you to make the most out of this shoot. From time to time the beach in this are reveals the relicts of other old piers, and there's always a variety of different images one can create. 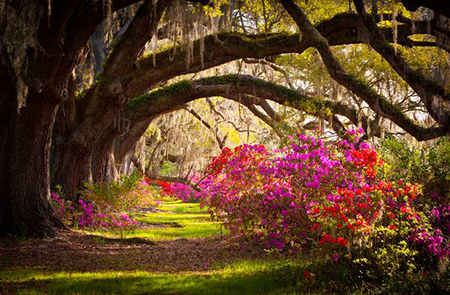 The rest of our day will be spent exploring some of the south's oldest and most photogenic plantations. 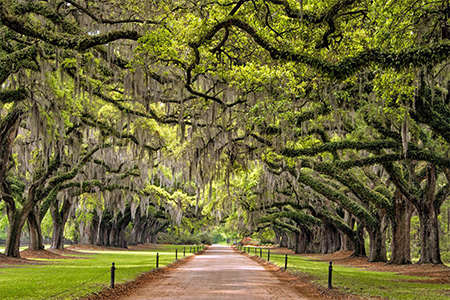 These historical symbols of the south have great oak lined driveways filled with textures of old moss and trees lined one after the other. 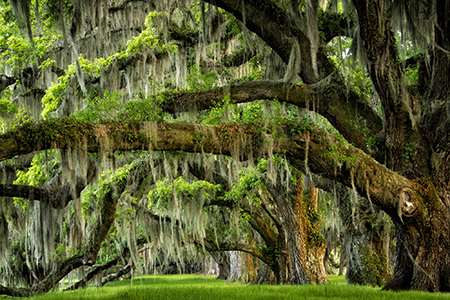 Each plantation offers its own unique take on this idea, and we'll fill our memory cards up with all the mossy goodness you can handle! Day 2: We'll spend our day on Edisto Island. Our morning shoot will look over some of the craziest trees in the world. These old skeleton trees grow out of the sand and are battered by the surf. Botany Bay is a great place for landscape photography and we'll start our morning off right exploring this little slice of photographic heaven. We'll explore some of the architecture and ruins of the area after sunrise and during the early part of the afternoon. After lunch and a break we'll spend our evening photographing the iconic Arthur Ravenel Bridge, a huge span that helps connect the crazy waterways around Charleston. After our evening shoot we'll retire and enjoy some much deserved southern hospitality at one of Charleston's great restaurants. Day 3: Another day of exploration as we spend the morning at the Magnolia Plantation looking at the rich history of the architecture and exploring the wondrously lush grounds that surround it. Our evening will be returning to Edisto island for a sunset shoot, and if mother nature cooperates, we'll stick around and do a little night shooting as well. Day 4: After a big southern breakfast we'll settle in to looking over all those amazing images you've gathered during our time together. Whether Lightroom or Photoshop is your preferred method of processing images, We'll help you with some little tips and tricks to help make the most of them. After our processing session our time together will conclude. You have the rest of the day to explore Charleston on your own, or catch a late afternoon flight back home. Whatever you choose, you'll have a camera full of images, and a heart full of southern charm to take with you. Lodging is included in the workshop price. 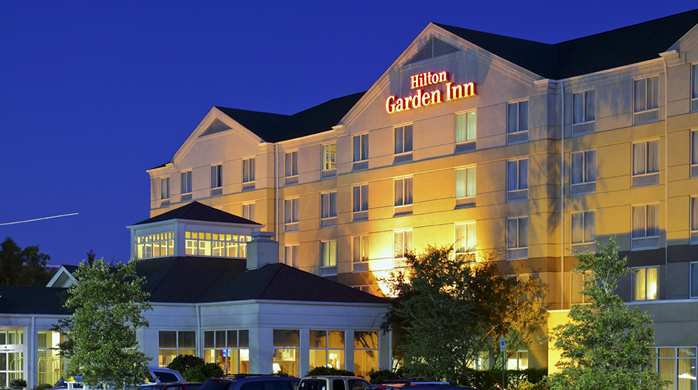 We will be staying at the Hilton Garden Inn, located in Charleston. The Hilton offers a free shuttle from the Charleston International Airport, an on-site restaurant, and wi-fi throughout the hotel. Rooming for this workshop is based on double occupancy, however if you would like your own room, there is a $600 single supplement charge. What type of camera gear is recommended? We recommend a 70-200 or 100-400. 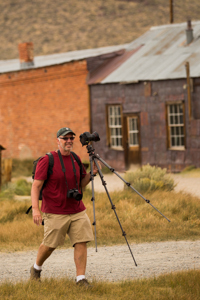 A sturdy tripod that will allow you to adjust for horizontal as well as vertical compositions. Extra Memory. Ideally you should have at least four memory cards of 16gb or greater. Extra battery + your charger. Long exposure night photography will consume more power than you may be used to. Filters. Optional but if you have them, bring them. 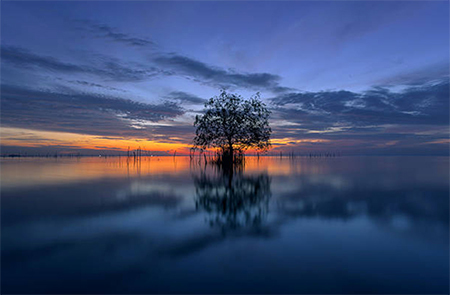 A polarizer and graduated neutral density filter is a great tool to have along just in case. Your laptop, and a good camera backpack. if you are bringing your laptop and would like to back-up your cards, be sure to bring a memory card reader and an external hard drive. What other gear is recommended? Is this a tour or a workshop? → This is a workshop but it is best if you are familiar with the basic settings of your camera because you don't want to be figuring out basic exposure while the action is unfolding in front of you - that would probably not be the best situation for getting the "shot," nor for learning. 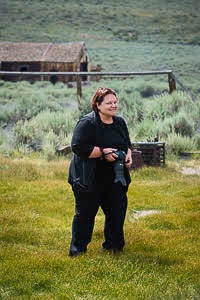 However, our instructors will be available in the field with suggestions about exposure, composition and technique; but in general, its best to come with a working knowledge of your camera gear. Back at the hotel, we have options that are more of a workshop format where we focus specifically on Photoshop post-processing techniques to bring out the most in your images. What type of clothing and shoes should I pack for the trip? Most walking will be over uneven surfaces. Therefore comfortable shoes with rubber soles are highly recommended. → High temperatures average 65 degrees, and overnight temperatures average 32 degrees. There is a chance for both sunny and cloudy days which provides a nice mix of conditions. → Yes. The hotels all have wifi access. I plan on travelling alone. Do I need to bring someone? 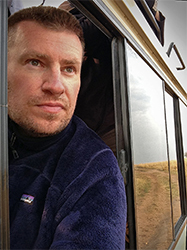 → Because we have limited room in the van we recommend bringing one small soft-sided piece of luggage with your clothing and other items, and one bag for your camera gear. → YES! We recommend purchasing travel insurance to cover any non-refundable registration fees, travel, lodging, equipment rental or any other related expenses. I've got a bunch of little questions. Who should I contact? → Always feel free to contact us at info@apertureacademy.com. We'll do our best to answer all your questions. Transportation from our meeting location, to the other workshop locations, then back to our meeting location. Lodging is included and based on double occupancy. If you would like your own room, there is a single supplement charge of $600. Wow, what a weekend! Got some great shots and got wet! Jean and Brian are great to work with, they are knowledgeable, patient and friendly. Looking forward to the next adventure with the Academy!! If you are a visitor to this site and wondering if you should sign up for a workshop I'll quote Jean and say "it's all in there" for whatever you are looking to get out of workshop! This was a great workshop! Not only did I get to go to several "must see" places but Brian & Scott were very helpful in improving my composition skills. All the workshop participants were a lot of fun and willing to share tips & secrets. I highly recommend this workshop!